July 19, 2011 – Mother Nature wrecked havoc along the Front Range and south eastern Wyoming last week—again living up to the region's weather reputation as "hail alley." The hail that cut a swath through Colorado on Wednesday was accompanied by monsoonal rainfall that flooded streets and property on a daily basis. Cheyenne was ground zero for golf and tennis ball-sized hail on Monday evening that pounded vehicles and homes. The Rocky Mountain Insurance Information Association reports the insured damage to cars and homes in Colorado from last week's storms is estimated at $164.8 million as the result of approximately 29,800 claims—17,200 auto claims and 12,600 homeowners claims. The lion's share of the insured damage was due to the widespread hail that fell on Wednesday south from Fountain through the Denver metro area hitting Lakewood the hardest, along with significant damage reported in Loveland and Fort Collins. The large hail that rained down on Cheyenne Monday evening is estimated to have an insurance price tag of $120 million resulting from approximately 19,800 claims—15,200 auto claims and 4,600 homeowners claims. These are preliminary estimates and are subject to change as the claims process continues. Fortunately, homeowners insurance covers damage from wind and hail, and damage to vehicles from hail and flooding is covered if you carry comprehensive insurance on your auto policy. Some carriers have set up emergency drive up claims centers in the hardest hit areas to help speed up the claims process and take care of customers. "Mother Nature reminded us last week that severe weather season is still in full swing in the Rocky Mountain Region," says Carole Walker, executive director of the Rocky Mountain Insurance Information Association. "It's important for all of us to be talking to our insurance representatives to make sure we are protected and have the coverage we need—especially during these peak months for catastrophic weather." Be prepared to give your agent or insurance representative a description of any damage. 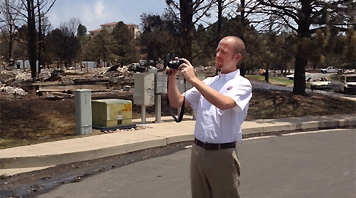 Your agent will report the loss immediately to your insurance company or a qualified adjuster. Some companies also have 24-hour, 800 numbers for claims assistance. Take photos of damage. These will help with your claims process and will assist the adjuster in the investigation. Prepare a detailed inventory of all damaged or destroyed personal property. Be sure to make two copies—one for yourself and one for the adjuster. Your list should be as complete as possible, including descriptions of the items, dates of purchase or approximate age, cost at time of purchase and estimated replacement cost. Hiring a reputable contractor to do repairs or construct a new home is critical. Word of mouth is still one of the best ways to choose a contractor. Also check with the area Better Business Bureau. Make certain they are licensed and have adequate insurance coverage. Don't become a victim of disaster fraud. After a natural disaster, professionals often go from door-to-door in damaged neighborhoods, offering clean up or repair services. Many of these business people are reputable. Others are not. The dishonest ones may pocket payment without completing the job or use inferior materials and perform shoddy work not up to code.